November 18, 2018 - Well running an organized trail race at the Ledges area will be no more! So sad the CVNP decided this area was getting too much use, but I am here to support the park. The weather was a perfect uppers 30 degree day with some sun, so after the first 2 miles it was comfortable to run. The trail is always a little technical down by the rocks, but the rest was smooth sailing. 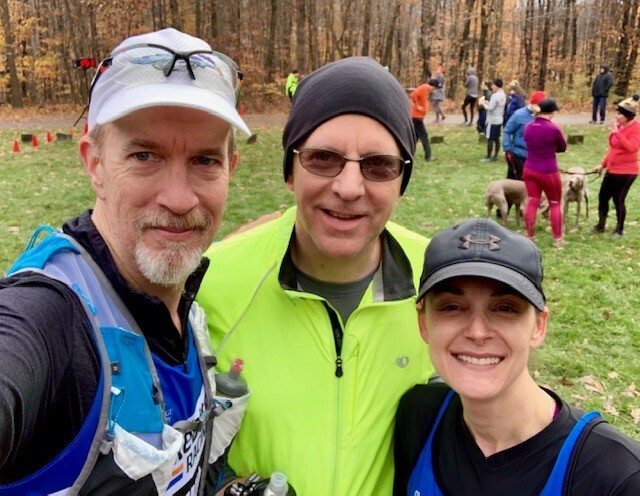 I ran with Kelly Baker, and Kevin Madzia, and we enjoyed every bit of this final race at the Ledges.